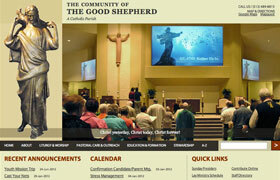 The Community of the Good Shepherd is one of Cincinnati’s largest Catholic parishes with over 100 ministries and outreach programs that span the globe. We redesigned the website in 2011 on the Business Catalyst platform to enable church staff to easily update the site, especially announcements and calendars, without technical knowledge and at a lower cost. The website has a rich CMS system, eCommerce capability, built-in email marketing, complete SEO with reporting and analytics, and custom built modules that enable staff to quickly update pages or create new ones without worrying about style and formatting. A facility tour enables brides to view decorating possibilities in the community room, and a home page slideshow demonstrates the four pillars of Good Shepherd’s mission.